(Newser) – John McCain said Thursday that President Barack Obama is "directly responsible" for the mass shooting in Orlando, Florida, because of the rise of the Islamic State group on the president's watch, the AP reports. The Republican senator made the comment Thursday while Obama was in Orlando visiting with the families of those killed in Sunday's attack and some of the survivors. "Barack Obama is directly responsible for it, because when he pulled everybody out of Iraq, al-Qaeda went to Syria, became ISIS, and ISIS is what it is today thanks to Barack Obama's failures, utter failures, by pulling everybody out of Iraq," a visibly angry McCain told reporters in the Capitol as the Senate debated a spending bill. 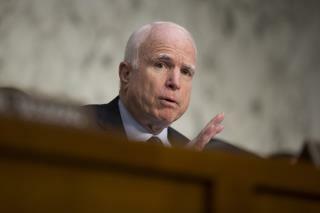 "So the responsibility for it lies with President Barack Obama and his failed policies," McCain said. I hope e gets voted office i doubt it. His people are stupid. Gawd did America dodge a bullet in not electing that senile warmonger!